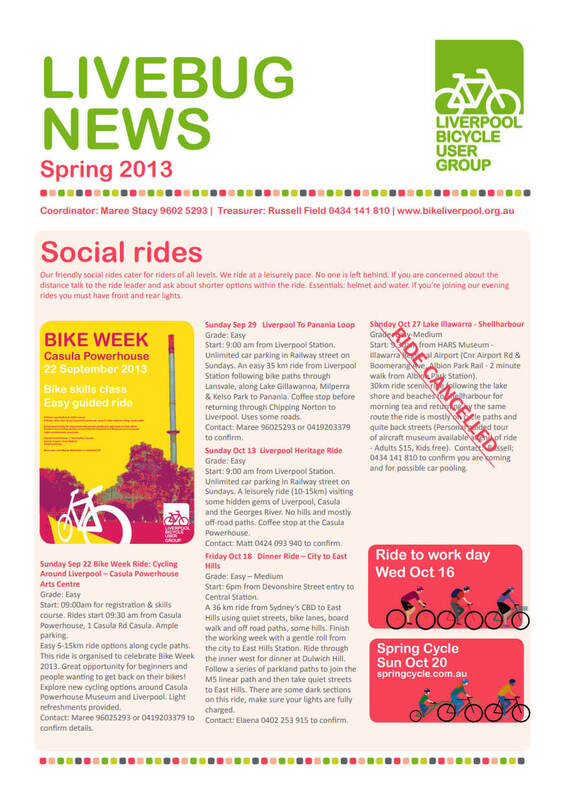 Spring 2013 newsletter is out! Check out our latest news and upcoming social rides – including our Christmas Lights Ride – in the Spring newsletter. We’ve been having some spectacular sunsets of late. If you only see Liverpool from behind your windscreen you’ll miss seeing the best bits. This is the view from the bike and pedestrian bridge over Chipping Norton Lakes. Join us for a short easy guided ride to celebrate bike week on 22 September. If you’re returning to riding boost your confidence with a bike skills workshop before the ride. All welcome. Call Maree for more information 0419 203 379. Error: Error validating access token: Session has expired on Wednesday, 06-Feb-19 02:49:57 PST. The current time is Friday, 26-Apr-19 02:57:31 PDT.